Okay, so I need to rescue a person before the fog sets in, correct? Using this weather chart as as example, what days should I enter the TV? The cloud symbol doesn't indicate fog, just that it would be cloudy. Trying to remember but I believe the way the game describes it is that fog appears after a spell of rainy weather. If you see 3 umbrella icons on the weather forecast then I would take the last day as the deadline. Therefore from the example above, I would take the afternoon of Sat 16th to be the final deadline for you to clear that dungeon. It's no biggie even if you do miss it, the game just resets you back a week, giving you enough time to go through the dungeon, although I imagine doing S.Links again would be a hassle. ^ Don't forget: POPULARITY LEADS TO INTIMACY!!! The mission to save Kanji has begun. I've read that the suggested level for his dungeon is 25-27. My current level; 11. Goodness, I should have listened to Chie when she said I should go into the dungeons to practice. I'm gonna begin leveling up today, cuz it's such a struggle fighting shadows, and I'm playing on freakin beginner mode! It's 5/20 in the game, and I have until 6/4 to save him. Edit: Got up to 20. Suggested level for the mini boss is 23. I'm getting there. If you haven't done so already, go back to where you had to save Chie and Yukiko, I believe there's and extra boss that when defeated will give you a bonus weapon for one of your characters. I forgot who's though. ^ Done all of that. Just glad to be in the normal world now; going to school and hanging with friends. I'll make sure I'm very prepared for the next rescue. Persona 3 movie, coming out this November. Probably the first in a series of movies. Huh. Did not know there was gonna be an anime following Persona 4 The Golden. Look how cool the menus look FFS. Someone inject that style straight into my veins. ^ Why is it so damn beautiful? So after being told for months and months that Persona 5 will be coming out in 2015 we finally got a release date and it's....Summer 2016. Sounds like the PS4 edition might be the reason for the delay? Maybe, just guessing. I actually don't mind, I have so many games to play already with more still to come out this year too so a gap would be nice as I finish those off. 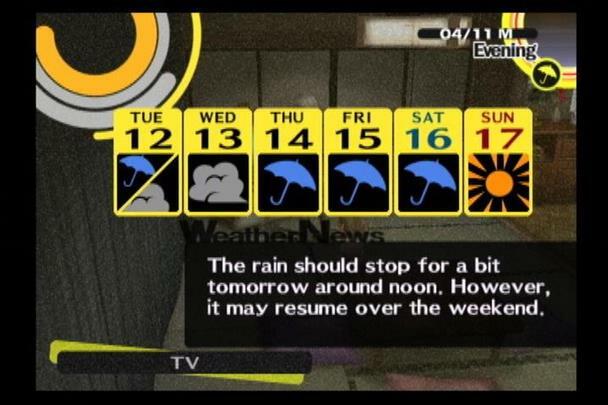 Considering the summer months are typically barren for game releases anyway then it might just be perfect to settle in over the summer months and play it. Now it's confirmed, a Japan release date in September and a US/European release in February. The UI and presentation still looks second to none.